In the old media, you might hear that RTE “only” lost €17m in 2011, that was its deficit. That’s true but in addition, RTE lost €50m on its pension fund, and as we are all on the hook for the RTE pension fund, that loss comes back to us. And who do the RTE Top 10 get paid? These are the RTE figures. Does these people get additional income? 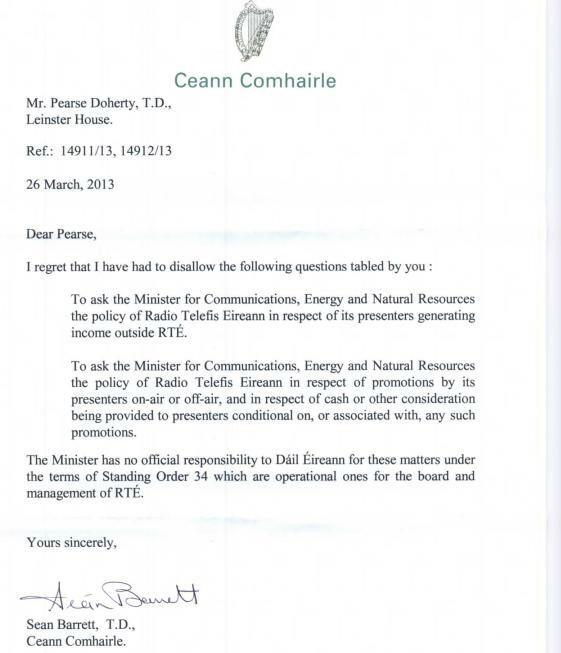 Well, this week the Sinn Fein finance spokesperson Pearse Doherty tried to find out and this is what Minister for Communications, Energy and Natural Resources Pat Rabbitte responded, or actually this is An Ceann Comhairle’s response because the questions were disallowed. 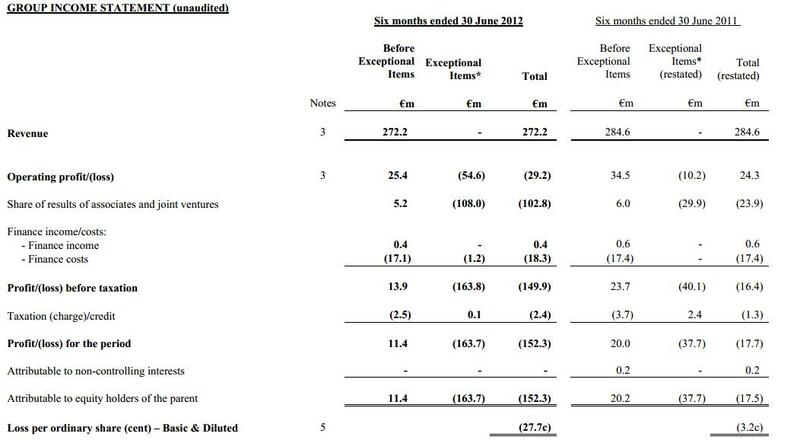 And what about the loss on the pension fund in 2011 of €50m? 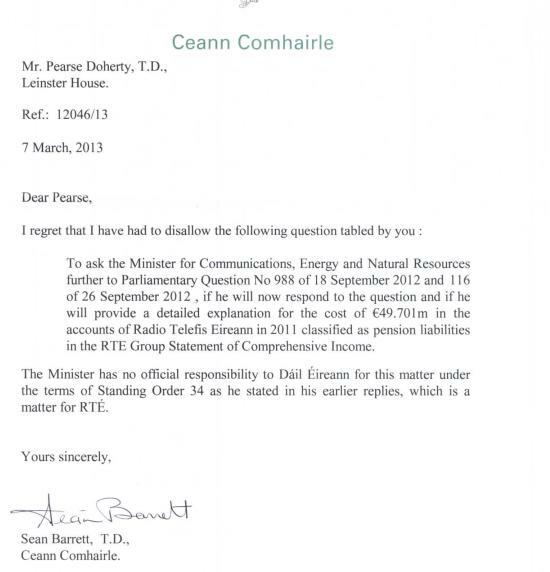 Again, Minister Rabbitte was asked but here is the response via An Ceann Comhairle again. I must admit that I don’t like the Number 1 best paid presenter on RTE, Pat Kenny. Not because of his talents as a broadcaster, even I can appreciate that the man is talented. We can all carp about personal styles and position on various matters, but the reason I don’t like Pat is that I have to spend 5 minutes of each day dealing with the European Commission and the EU Ombudsman over a request for the documents in support of Ireland’s biggest ever property tax break, for the development of the Ritz Carlton in Powerscourt in Wicklow where Pat reportedly owns property suites. In 2009, it was Micheal Martin, then the foreign affairs minister who had to apply to the European Commission for permission to grant tax reliefs on the Powerscourt development which cost €200m. Minister Martin was criticized by the European Commission for the tardiness in submitting the application, which was some years after the development. Pat Kenny is understood to have benefitted from tax breaks on the development, and with the property downturn, Pat is understood to be nursing losses on the development, and with the development in examinership and prospective buyers trying to repudiate guarantees of income on the suites in Powerscourt, Pat must be facing a worrying time. He’s not alone, but every obstacle in getting at the documentation from the European Commission just raises my gander towards RTE’s highest paid presenter. The EU Ombudsman is currently dealing with the refusal of the European Commission to hand over the documentation for the state aid tax breaks given to rich folks at Powerscourt. I would also love to know what, if anything, Pat gets from the various hawkers of books, records, events and businesses on his radio show. Perhaps he gets nothing, but we are none the wiser from Minister Rabbitte’s response above. Ireland is a media market 1/15th of that in the UK. The payments made to its presenters are outrageous, and every time you get an error-ridden badly researched current affairs programme, I blame these salaries for the lack of RTE researchers and research. The last time Vincent Browne revealed his salary on TV3 in 2011, he was being paid €58,000 per year. TV3 presenters typically get paid €40-50,000. RTE claims it is bound by the terms of its contracts, and as a legal entity that is correct, but we saw in the case of Thomas Crosbie Holdings recently where the Irish Examiner and other newspapers and radio stations were placed in receivership, and where the Sunday Business Post was placed in examinership, that companies that have unacceptable contracts can use legal mechanisms to extract themselves from those chains. With RTE losing €70m per annum and paying the above salaries, RTE should be placed in examinership tomorrow so that new contracts could be offered at a fraction of these levels. Meantime, its presenters should be challenged about their outrageous salaries at every opportunity. Who will control IN&M after the mooted debt for equity swap? The fate of Ireland’s largest print media group, Independent News and Media is currently being thrashed out behind closed doors between the bankers propping up the group and its management, and the latest speculation is that loans to the group will be converted to ordinary shares. The group had over €420m of loans at the end of June 2012 which are owing to eight banks. Recent press reporting has suggested that state-owned AIB is owed €70m and that Bank of Ireland, in which the State has a 15% stake via ordinary shares, is owed €80m. On the other hand, shares in IN&M are today trading at 3.5c which values the total equity at just €19m, a fraction of what it was worth a year ago when IN&M was de-OReillyed and an even smaller fraction of its €1bn+ valuation at peak in the mid 2000s. 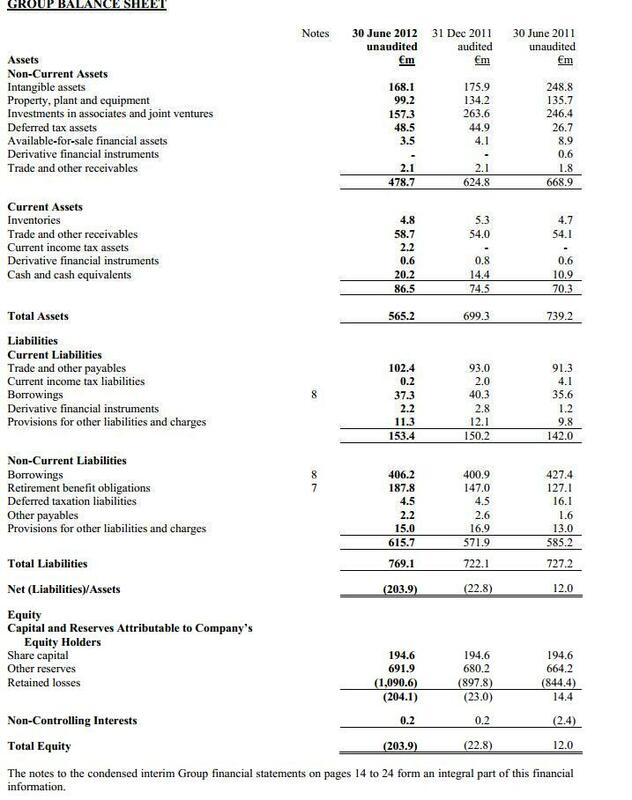 It is understood that controversial figure Denis O’Brien presently has a 29.9% stake in the group – a stake valued at less than €6m at today’s prices – and that fellow billionaire Dermot Desmond owns 6.4% and that Tony O’Reilly and family own 13.3%. There has been unconfirmed speculation, that as part of a restructuring of the group – which will incidentally see members of the group pension scheme take big hits – that the banks may write off €100m of their debt. There has also been speculation that as part of the deal, that the main shareholder Denis O’Brien might inject additional capital, some sources have suggested as much as €50m, into the group. The group is in dire financial straits, having a fully recognized loss of €177m for the first six months of 2012, and a balance sheet that was insolvent to the tune of €200m at June 2012. So, what will a debt for equity swap mean for the existing shareholdings? We await details but given that 100% of the equity is today worth a measly €19m on the stock market and that the speculation is that the group needs to see a reduction of €100m in bank debt, you might expect the existing shareholders to be completely wiped out as part of any swapping of debt by the banks. If existing shareholders inject additional capital, then that might change the mix, but the new capital injection would have to be substantial. Minister for Finance Michael Noonan recently refused to confirm that AIB would seek equity losses ahead of any debt write-downs. In a deal involving Irish services company Siteserv last year, Anglo Irish Bank controversially wrote off €100m of debt in a deal which saw shareholders walk away with €5m. Denis O’Brien was associated with the buyers of Siteserv and it was subsequently reported that Anglo also wrote off debt. More recently, IBRC has reportedly written off €64m in a British fuels company, Blue Ocean Associates in a transaction also involving a sale to interests associated with Denis O’Brien. 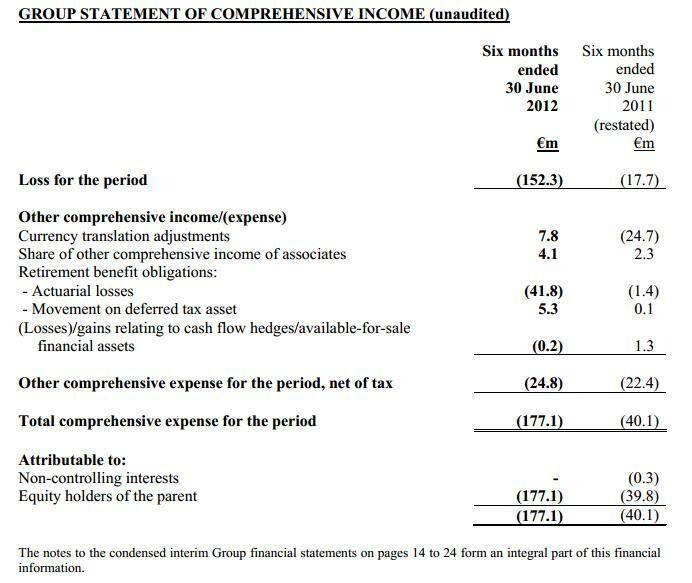 The results at IN&M for full year 2012 were seemingly due in March 2013, but there is presently no calendar for their release on the IN&M website; in 2012 the results were released for full year 2011 on 22nd March 2012 . IN&M issued a statement earlier this week, merely confirming that discussions with its lenders were continuing. Any deal will be closely scrutinized because (a) it involves our largest print media group (b) it involves Denis O’Brien and (c) it involves two banks which we either own or have a stake in. Events unfolding in Cyprus where that country decided, with agreement from the EuroZone group of finance ministers, that sub-€100,000 depositors would be subjected to a 6.75% levy, show that Ireland had choices when it came to dealing with bondholders, and that it still has choices. The Cork parish of Ballyhea has been protesting against the bondholder and wider bank bailout, for 108 weeks, with weekly protests which now alternate between Ballyhea and the nearby town of Charleville. They’ve also gone on the road in the past, with a walk/jog/run/cycle/crawl to Leinster House to hand in a petition, they’ve protested outside the ECB headquarters in Frankfurt and made their grievances known to Irish central bank governor, Patrick Honohan, they’ve held protests across Munster, Leinster, Connacht and Ulster and they’ve presented their protest across every medium that would listen, including nationally and internationally on TV. Today at midday, seven of the protesters will be meeting with a group of MEPs in the European Parliament in Brussels. They will be meeting with British MEP, Sharon Bowles, chair of the Economic and Monetary Affairs Committee, who has in the past been vocal in her support for debt relief for Ireland. The protesters will again be setting out their case and requesting the MEPs to facilitate a meeting between the protesters and the ECB. There will be coverage later on here today following their meeting. You can find further details of the protest including photographs and video here. Protester spokesperson Diarmuid O’Flynn has written an article on today’s meeting. At 10am today Wednesday (Dublin time), Cypriot authorities are set to announce the details of near-term banking arrangements. They’re still talking about banks re-opening tomorrow Thursday 28th March, 2013 but the betting on here is that the re-opening is delayed to Tuesday next 2nd April 2013 after the Easter break which is recognized in Cyprus. 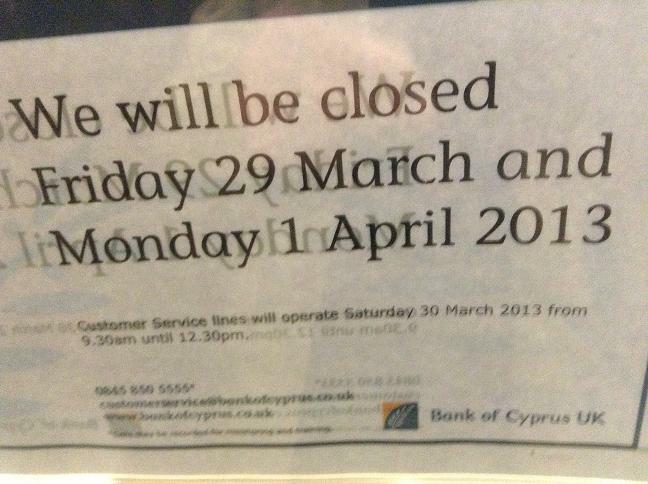 Although there is nothing solid, notices on Cypriot banks in London yesterday – see above – make no reference to a Thursday re-opening but do say the banks will be closed over Easter. It seems that depositors with more than €100,000 at Laiki Bank have lost the best part of 100% of the excess over €100,000 with the Wall Street Journal reporting that only 20% of the excess over €100,000 will be returned to depositors and the return “may take years”. The haircut on the excess over €100,000 at the second of the problem Cypriot banks, Bank of Cyprus is reported to be around 40%. Thousands of job losses are expected at the two banks. There is still no solid detail on capital controls but they may include a ban on electronic transfers and border checks for those carrying excessive currency. What was described as a “very temporary measure” just yesterday is now being described as measures for “only a short period”. The BBC is reporting capital controls will include a ban on cashing cheques and export limits on euros. UPDATE: 27th March 2013. Less than 14 hours before banks in Cyprus would be expected to re-open on a typical Thursday, we still don’t know for sure if they will in fact re-open tomorrow, or if they will be kept shut until after the Easter break, with Tuesday 2nd April 2013 being the favorite bet on here. We are getting dribs and drabs of details on the new capital controls, with Greek newspaper Ekathimerini having a convincing-sounding report as to the details. 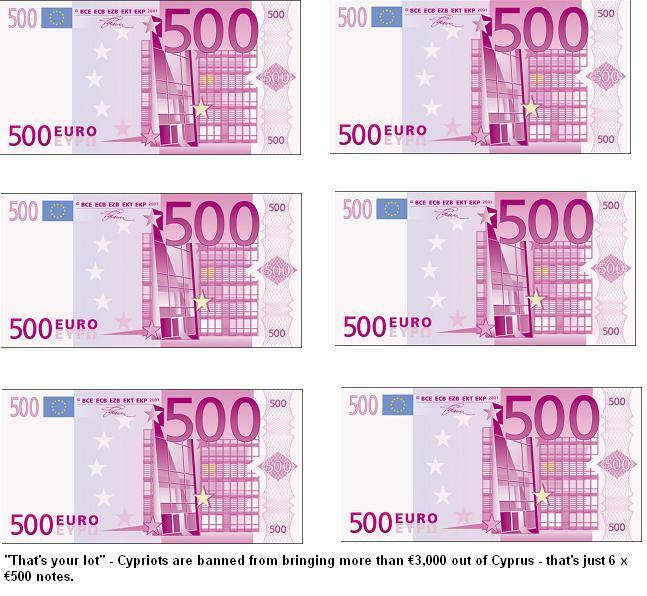 Those leaving Cyprus will not be allowed carry more than €3,000 with them. Here is what €3,000 looks like. Cypriots can transfer €10,000 abroad per quarter per student for students studying abroad. Other payments abroad must be for commercial imports. Spending on credit cards abroad is limited to €5,000 per month per person. UPDATE (2): 27th March, 2013. The BBC, quoting “a spokesperson” for the central bank of Cyprus, is now reporting that banks will open in Cyprus between 12 midday local time (10am Dublin time) until 6pm local time (4pm Dublin time). For what liitle it’s worth, I’d still take that with a pinch of salt. Capital controls are still being finalised.